eZee Absolute is a 360-degree online hotel management software which helps management of the property remotely. eZee Absolute takes care of the day to day operations through the system itself like group bookings, housekeeping, taxation and accounting and much more. eZee Technosys is one of the few hospitality solutions providers in the world, offering a complete suite of IT solutions for the hospitality industry. Offering solutions that cover hotel management, online room distribution, restaurant management, guest feedback and mobile applications and more. 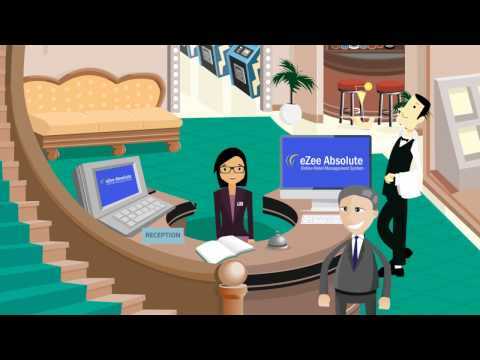 eZee Absolute is a highly flexible and feature rich cloud based property management system. Bringing together all the strength of cloud technology and value-added features, it simplifies hotel operations while helping you utilize every opportunity to boost hotel revenue. Bringing all your hotel operations at your fingertips, the hotel PMS mobile app will let you take care of your hotel conveniently. Being in the hotel business, you are aware of the fact that managing the process of rates and inventory updates on distribution channels, maintaining rate parity, running promotions etc can be a nerve cracking process. No matter if you think the mighty OTAs are friends or foes, there is no denying that these travel sites bring an immense amount of business and they are here to stay! To help you out, eZee’s all-in-one solution, provides a cutting edge channel management system that makes it easier than ever to manage your hotel inventory across all connected distribution channels. The seamless connectivity between the hotel channel manager and OTA saves time and ensures a quick ROI. Encompassing assorted features of systematic restaurant management, eZee Optimus will let you take your restaurant to the next level through feature-rich and adaptive functioning. The cloud-based POS system will help you streamline your services while focusing on customer experience. Robust features like menu management, table reservation management and others will make your complex operations easy to carry out on a daily basis. We understand your need to get more bookings and earn revenue. And because of that, we’re focused to make the best hotel website for you, which will build your online presence and win over visitors and bookings. eZee is a singular organization that offers complete hospitality management solutions including an extraordinary on-premise hotel PMS. Going further, eZee’s desktop based hotel software is packed with numerous prevailing functionalities that make it easy for you to manage your daily operations while improving your overall guest services. Aside from standard hotels, eZee on-premise Hotel PMS is ideal for motels, resorts, clubs, B & B's, small hotel franchisees, clubs, condo's, hostel and apartments as well. Q. Is there any contract or lock-in period? There are no contracts or commitments when you start using the services. eZee PMS being a recurring subscription software, does not require you to sign any such minimum period usage contracts. You can know more about this from our terms of service. Q. What is the difference between eZee Ultimate and other plans? eZee Ultimate is the only plan which allows you to use eZee’s leading edge hospitality solution for free. The only thing you pay is a transaction fee on confirmed bookings. Whereas, in our regular subscription plans, you pay a fixed subscription fee on a monthly, quarterly or yearly basis. Q. How do I change my existing plan to some other plan? Yes, you can change your existing plan to some other plan by simply informing us a mere 2 months before you want the transition to take place. We are very flexible in doing business, thence you are free to move to a fixed plan.